This is a common question we come across on our whale watching tours, and is one of some debate. What is a breach, you may ask. 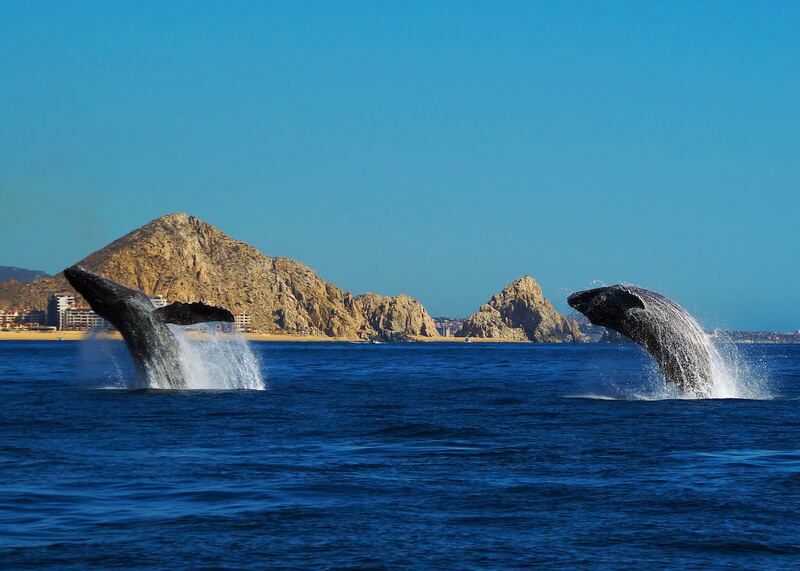 A breach is when the whales body is at least three quarters of it’s length out of the water or more. When guests see these enormous creatures lifting 3/4 of their entire body weight out of the water, the first question is WHY?! Since these animals can weigh up to 50 tons full grown, the water displacement from a breach is huge, probably more than an Olympic swimming pool. So first we must talk about the how before getting to the why. 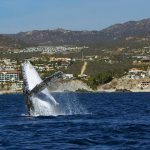 The humpback will descend around 100-200 feet below the surface, and will then make a huge turn toward the surface and propel themselves up to 20 mph upward until finally breaching the surface and landing with a huge crash. There is no signal when this will happen next, so it is always advised to keep your eyes moving to catch the most action. 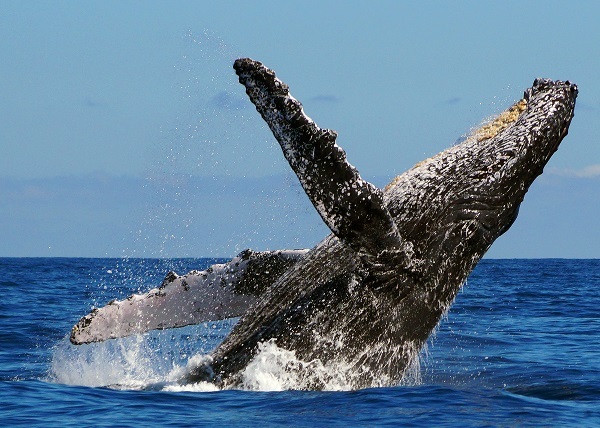 Also, both males and females can be seen breaching, but the majority would be the males. Females are mainly seen breaching when they have a calf in tow, as a way to teach these calves to breach themselves. It is miraculous to me at the amount of consecutive breaches we are seeing right now, especially knowing that these animals have not fed since leaving the krill-rich Alaskan waters. So now to the WHY. 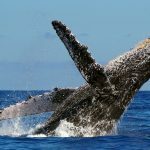 There have been several scientific articles posted on this issue with some debate as to the main reason breaches occur so frequently on the mating grounds. Most likely it is a combination of the reasons mentioned below, mainly because these animals are mammals and just like humans have very complex emotional systems and behaviors. One theory states the animals do this to remove parasites and dead skin cells from their body. If you are able to drive near the area after a whale has breached, you will see much particulate in the water, which is this sloughed off skin. Secondly, some scientists believe they do this to alert other whales of possible dangers, predators, mates, food, etc. in the vicinity. 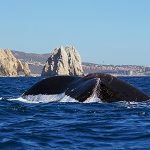 Because although baleen whales use vocalizations, these are mainly for mating purposes, unlike toothed whales like dolphins, which use sounds for communication and social interaction on a daily basis. Third, researchers states that the males do this as a mating display to attract females. We know peacocks use there brightly colored feathers to attract mates, but what to do whales have that sets them apart? SIZE They’re massive creatures and what better way to show how big and strong you are than by propelling your entire body out of the water! Finally, some scientists believe they are doing it just for fun. This is another very good theory, as you can often see calves breaching and exhibiting many other behaviors over and over. The feeling of watching this is something similar to seeing a puppy playing in the yard with a ball, very very playful in nature. As I stated above, my opinion is that breaching is used for many purposes depending on the nature of the situation and how the individual is feeling. Either way, it is a magical sight to see and one that will provide you with lasting memories, no matter if you are able to get the photo or not! 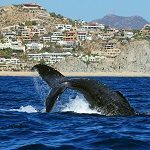 Because at the end of the day, nothing can give a human more respect of these magnificent creatures than seeing them up close and personal of a whale watching tour right here in Cabo San Lucas with Cabo Whale Trek!